With summer upon us, you may be concerned with your concrete’s ability to make it through the season without cracking. Concrete is one of the most durable materials we have at our disposal, which is why it is the material of choice for so many driveways, patios, footpaths and even interior floors. So, how can you avoid it from cracking? Well, the truth is, the only way to avoid cracked concrete is to prepare it adequately. Once the concrete is set, little can be done to prevent cracking, which is why it’s vital that you engage the services of an experienced concreter. Concrete is susceptible to expansion and shrinkage due to factors such as moisture, temperature and soil composition. A skilled concreter will recognise this and engage in ‘controlled cracking.’ Controlled cracking involves the creation of joints within the concrete. These joints form a weaker point in the slab, so when cracking occurs, it is limited to the joint, instead of spreading across the slab. The strength of your concrete is directly tied to the surface you lay it on. You need to get rid of anything that could create a void underneath the surface of your concrete, as these voids will develop cracks further down the track. You should focus on removing any foreign objects, as well as any natural features like bumps, holes and even root systems. The ground needs to be prepared with a compactor because only a completely flat surface will allow for a strong pour. If you live in an area that is prone to nest-building animals, like ants, you should also use insect killer to remove any colonies. Nests will create voids underneath your slab. If you really want your concrete to have as fewer cracks as possible throughout its life, you should consider reinforcing it. Reo bars are the best way to strengthen your slab, and they will work to prevent small cracks from worsening by holding everything together. Expansion filler can also be used to reduce any problems associated with concrete not having anywhere to expand, such as corners and along walls. If there is no room for the concrete to go through its natural expansion, it will crack under the pressure. Your slab should be sealed after it has dried. Sealing the concrete creates a protective layer on top, which stops moisture from seeping in. 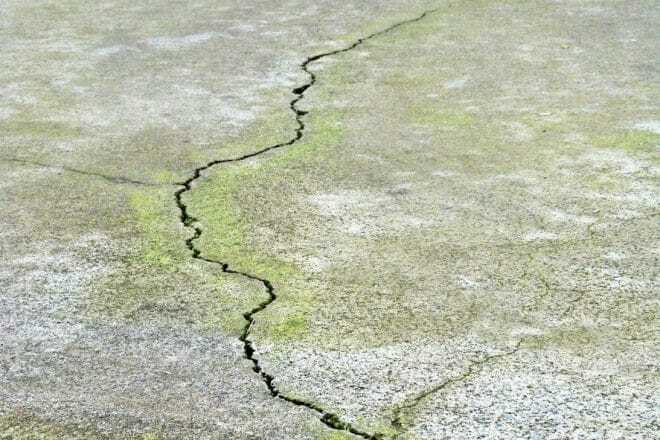 Moisture causes the concrete to expand, which can lead to cracking. It is also a must for anyone that lives close to the sea. If sea salt penetrates the slab, it can corrode any reo bars and weaken your slab. Thoroughly sweep the surface, or use a pressure-cleaner to remove any debris from the surface if you have one. It may be worth hiring a pressure cleaner if there are any stains on the surface of your concrete, as you’ll seal in any stains that aren’t removed. Once completely dry, you can either brush, roll or spray the sealant onto the concrete. Spraying is by far the quickest and easiest method, and all you need is a garden sprayer. You should start to see your slab turn white, at this point, you’ve used enough sealer. Make sure it is spread evenly across the surface, taking care to avoid any puddles. Once you’re happy with the coverage, make sure you allow 24-hours for the sealer to dry. Before starting the process, you should get a trusted weather report to ensure there’ll be no rain for at least 24-48 hours. All of these steps will help to prevent large, or random cracks in your slab, but the truth is, it’s impossible to prevent cracking in concrete completely. Its makeup means it will continuously expand and shrink and anything that goes through these processes will be prone to some cracking. An expert concreter will give your slab the best chance at enjoying minimal cracking, by putting significant time into preparing the surface and preparing the slab. This makes choosing the right contractor essential; you should always look for experience, expertise and passion for the job at hand.